“The authoress of Pride & Prejudice has been so good as to send me a new novel just published, Emma”, Maria Edgeworth in a letter to her aunt, Mrs Ruxton. Emma, of which no part of the manuscript survives, and no presentation copy inscribed by Jane Austen herself is known to exist, was published on 23rd December, 1815. The present copy (volumes I and III, est. 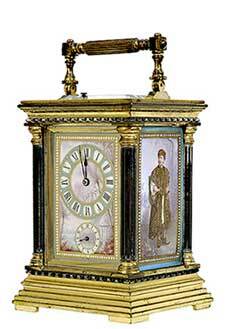 £70,000-100,000), is signed by Maria Edgeworth and has remained in her family ever since. 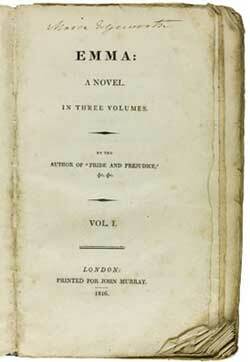 It is unique in being the only known copy of Emma given by Jane Austen to a fellow writer. Maria Edgeworth is regarded as the creator (in Castle Rackrent) of the first true historical novel in English, leading the way for Sir Walter Scott – who also greatly admired her work, calling her “the great Maria”. 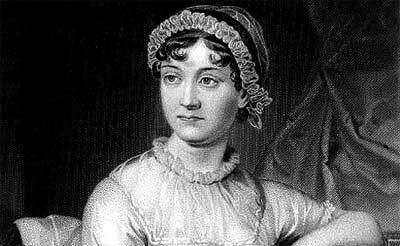 Jane Austen’s equally strong admiration for her older contemporary, who was the far more successful writer in her lifetime, is well documented. On 28th September, 1814, Austen wrote to her niece Anna Austen that: “I have made up my mind to like no novels really, but Miss Edgeworth’s, yours & my own”. On 16th September, 1813, Jane Austen wrote a letter to her sister Cassandra, in which she noted a visit with her brother and a niece to Wedgwood’s in London: “We then went to Wedgwoods where my brother and Fanny chose a Dinner Set, I believe the pattern is a small Lozenge in purple, between Lines of narrow Gold; - and it is to have the Crest.” The dinner set was owned by Jane Austen’s brother, Edward Austen, and as Jane was a frequent guest at her brother’s house in Chawton she must have seen, used and eaten from these dishes many times. The set has been in family ownership since purchase and will be offered with an estimate of £50,000-70,000. This extremely rare first edition of Jane Austen’s Emma given by the author to her admired fellow novelist Maria Edgeworth and the Austen Family’s Wedgwood dinner set to be offered in Sotheby’s London “English Literature, History and Children’s Books & Illustrations Sale” in December … an exceptional opportunity to acquire a unique component of Austen family life. For more information, visit sothebys.com.